Thanks to data from Moz founder Rand Fishkin’s new project, Sparktoro, we finally can turn a wide-angle lens to the issue of declining click-through rates from Organic Searches. 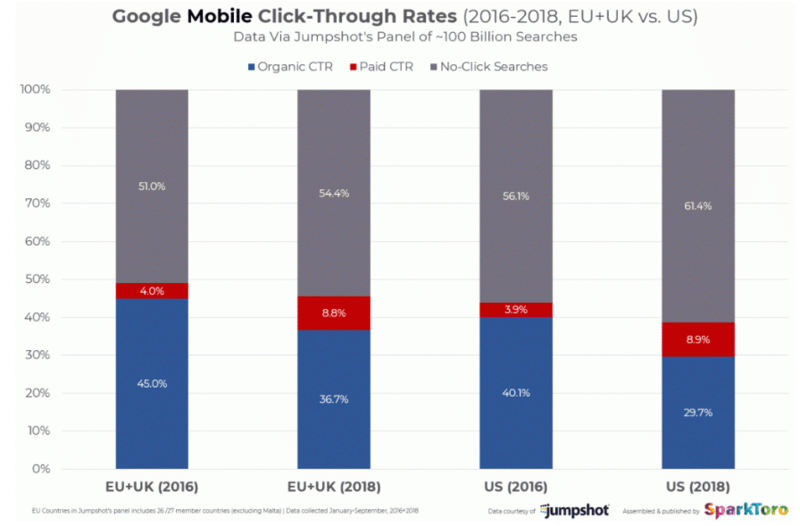 While it’s push towards clicks on ads is understandable as a business move (even Google has to make a ROI, right? ), the clear rise from 2016 to 2018 in no-click-searches reveals a worrying trend towards the search giant abusing its monopolistic power. While these numbers will vary from industry to industry (‘buy organic green tea’ and ‘how old is Hugh Jackson’ clearly have very different intent), the overall trend away from Organic clicks leaves many of us wondering what the future holds for businesses trying to gain search visibility. Thankfully, there are still options: high-ranking featured snippets show a high CTR, and when investing in a product, people still prefer to read details on a retailer’s website before committing themselves to buy. There’s only so much you can show in a search result page compared to an extensive guide, product page or case study. 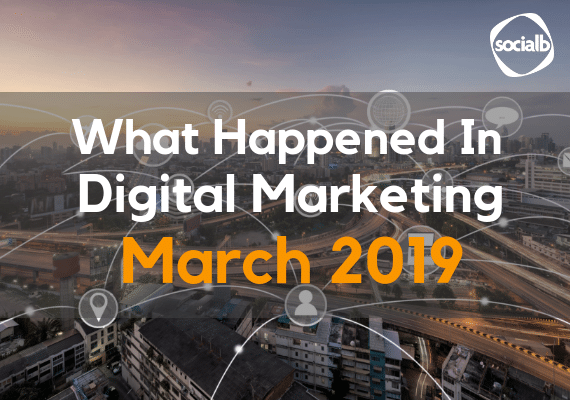 While investment in SEO still has a high ROI, it’s becoming more important than ever to focus efforts on obtaining top-ranking spots, especially featured snippets where available. 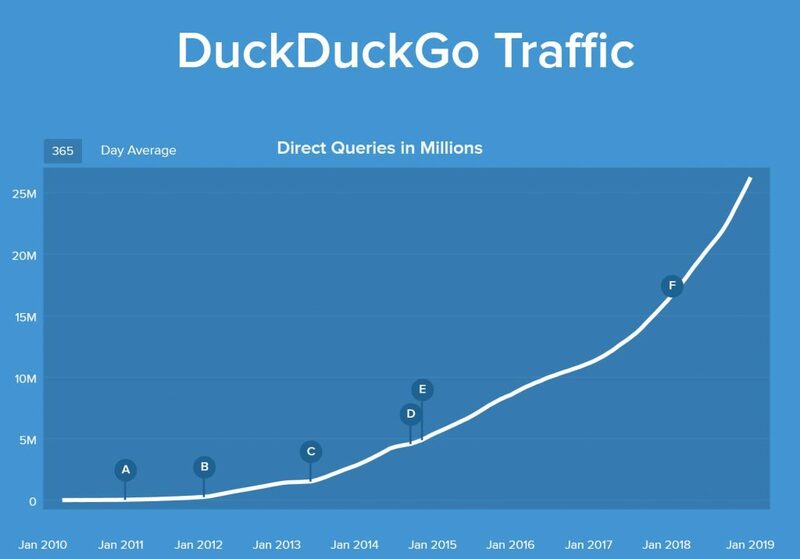 Search Engine DuckDuckGo (DDG) recently announced that it has served over 9 billion searches in 2018. Although this number may seem significantly small compared to the trillions of searches Google sees globally each day, when it comes to data privacy, they definitely seem to beat Google. With data privacy concerns rising, Google and Facebook have received a lot of flak in recent times with many people questioning privacy standards. Since GDPR has come to effect, a lot of people not concerned about privacy before have started to take notice and are more conscious of how their information is being collected and processed. This is where DuckDuckGo can prove to be a great alternative engine for you to target. According to DuckDuckGo, it never stores your personal information or searches history. It doesn’t follow you with ads or track you across the Internet. This is how they wish to promote themselves on their website. If this is what your audience demands as well, you need to keep a firm watch on DuckDuckGo and it’s growth and impact on your business. Pretty soon, search marketers might start looking at DuckDuckGo as worthy enough to warrant SEO efforts. It’s been reported that UK cyber-crime victims lose £190,000 a day, police statistics show. 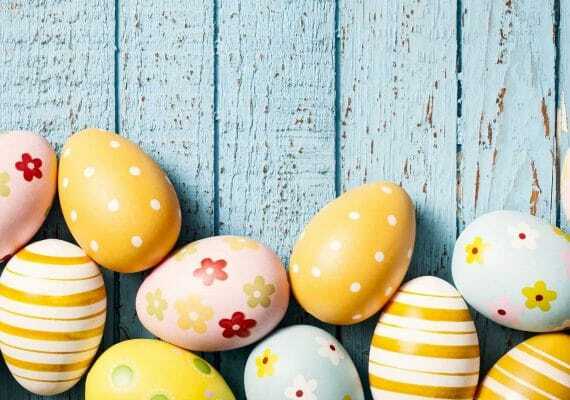 There was a 24% increase in fraudulent activities between April and September 2019, with a reported £34.6m stolen from victims, Action Fraud said. 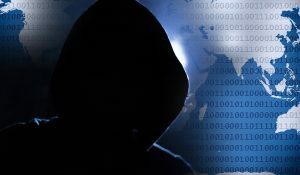 More than a third of the victims in that period are said to have fallen prey to hacking of social media and email accounts. Businesses also fall prey to these types of online activities, with big companies such as Apple and TV licence being imitated on digital channels by criminals trying to swindle money from consumers. When activities like this happen, it can have a huge impact on business, with trust wavering from consumers targeted by these imitation criminals. In the case of the TV licence email scam, more than 5,000 complaints were made over a three-month period. The emails were said to have been incredibly realistic, including the website that the victims of the crimes landed on. In cases like this, it is important for businesses to be reactive as soon as possible to try and help other consumers avoid falling for these scams. It also allows a business to retain the confidence of the consumer and keeping a healthy brand image. If it has been reported by consumers or someone in your organisation that they think that your business may have been imitated or they have received a fraudulent email, there are a few steps you can take. 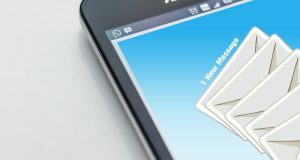 Sender’s email address – does it look like the official business email address or an email address that is used by the business? Subject line – if a business sends out emails on a regular basis you will be able to reference what subject lines have been used when sending out communications from the email platform you use. Spelling and grammar – this can be an indication of a scam if the there are clear grammatical errors. Content – if an email seems too casual or familiar it can be an indication of fraudulent activity, although with a lot of criminals becoming savvy, they will often copy the layout of the emails that are sent out by the business on a regular basis. The Landing Page – do the links from the email go through to the official business website? Security on landing pages – most modern and official websites will be secure platforms, this is indicated by the small padlock icon next to the URL of the website. 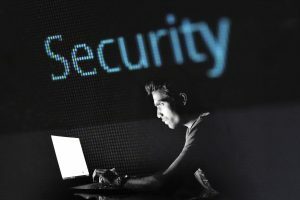 With cyber crime constantly increasing it is important to be vigilant with the activities that are going on around your business to prevent serious issues and protect the brand. If you believe or have had it reported to you that there is fraudulent activity going on regarding your business from outside sources, then you should report it to Action Fraud. The tool gives website owners and digital marketers the ability to see how Google is viewing their website. This is really helpful for SEO because the way Google views your website is pretty much the foundation of search. Utilising the HTTP response of a page will let you see if there are any errors on a page such as a broken 404 page, 301 redirect or ideally a 200 response which means the page is OK! The data obtained here can help you to look under the hood of the website and potentially spot errors that could be hampering your search performance but aren’t obvious at a surface level. Using the Live Test URL button you can see a rendered screenshot of how Google is viewing your website. We’ve tested this on a few websites and each time the rendered preview shows the mobile version of the website because Google now crawls websites mobile first. This may be a useful tool to help communicate with developers on the coding errors that could be affecting your website. Check out the new Search Console interface and inspect a URL on your website to test the tool for yourself. Reddit serves as the home to millions of monthly active users (330 million to be more precise), all having interests, some unique and some more common and covering virtually every topic imaginable. This means, depending on the targeting options, Reddit can become an even more useful tool when carrying out paid advertising. Potentially opening up the market of using it to test and find new audiences!